Raptivity - Rapid Interactivity Building Tool: Did-you-Know Raptivity? There are many fascinating facts, stories, theories, tricks and tips of certain people, things or processes. Do we all know about it? Most of us may not. After all we are humans and not overtly smart enough to retain all that is read and written. Likewise, Raptivity aids us in building interactive experiences which increase the retaining capacity of learners. Now the question here is ‘Do we really know the fascinating aspects of the famous intera ctivity builder, Raptivity? Yes/No.’ The devoted users would also have divergent views on this question. We realize that Raptivity is still to be explored and applied in varied ways for creation of interaction models. The possibilities are countless and we just need to get the right information to be on the path of discovering it every time a new course or presentation is to be designed. We brainstormed on how we can get across these interesting and engaging facts about Raptivity to all the users. And the outcome is that we are introducing a new series of Newsletter called “Did-you-Know” directly from the Program Manager’s desk. This series will be sent out every fortnight to all Raptivity users. It will also act as a forum for all users who can raise their queries and suggest ideas to the Program Manager. 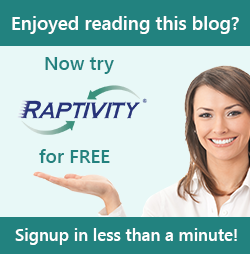 With every Did-you-Know newsletter, readers will get acquainted with the features of Raptivity and how these can be utilized to build enhanced interaction models. We are sure that our readers will be enlightened with this new series and would also share it with their friends and colleagues. You can also share new ideas and suggestions by writing to the Program Manager at idea@raptivity.com .